A clockwork wound musical movement with an 18 note comb. 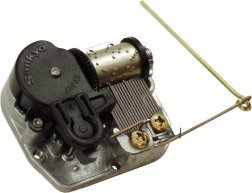 Great value for money movement complete with winding key, wire brake & attached rod (easily removeable if not needed). Perfect for jewellery & trinket boxes. For more information on the musical movements, please click here.